Tour Confidential: Which Tiger Woods record is unbreakable? 1. Matt Kuchar missed the cut at the AT&T Byron Nelson, snapping his PGA Tour-leading streak of 30 consecutive cuts made. (Jason Day, Dustin Johnson and Adam Hadwin now hold the longest active streaks with 17.) Kooch's stellar run calls to mind Tiger's seemingly unbreakable 142-consecutive-cuts-made record. Do you see that mark ever being broken? And what is Woods's most unbreakable record? Jeff Ritter, digital development editor, GOLF.com (@Jeff_Ritter): That cut-streak record is cemented, and so is winning a major by 15 shots. The 2000 U.S. Open will stand forever. Dylan Dethier, associate editor, GOLF.com (@dylan_dethier): I would be shocked if anyone even approaches 142 consecutive cuts made. There are more good players than ever and the game's best would be hard-pressed to attack made cuts with the same desperation as Tiger. As for his most unbreakable record? Mark Broadie touched on this for GOLF, but it's the 89 consecutive rounds where he beat the field's stroke average. As Stewart Cink told Broadie, "The field never has a bad day." Josh Sens, contributing writer, GOLF (@JoshSens): With apologies to Dustin Hoffman in Marathon Man, "Yes, it's very safe." No one is going to touch that cuts-made record. Even more distantly out of reach, though, I think, is the prospect of anyone ever holding all four majors simultaneously, as Woods did when he capped his Tiger Slam. That's never happening again in our lifetime. Or our children's. Or our children's children's. 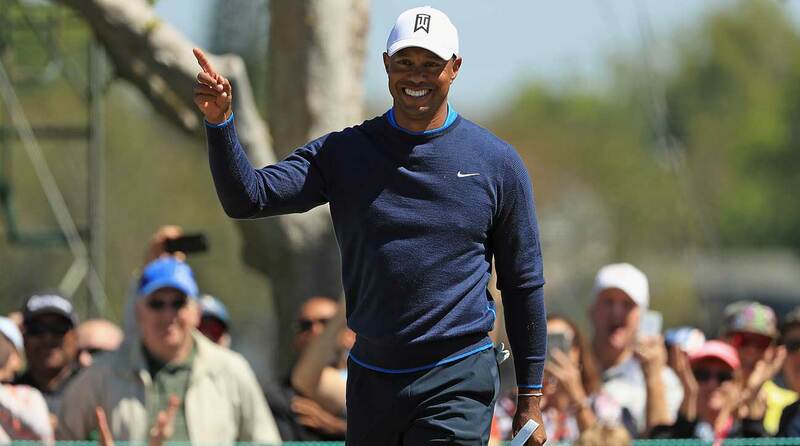 Joe Passov, senior editor, GOLF (@joepassov): That's a truly astonishing feat, Tiger's 142 in a row. Many thought Byron Nelson's 113 would never be broken...but Tiger isn't just anybody. Ironic connection, that Tiger's streak came to an end at the 2005 Byron Nelson, and Kuchar's at the 2018 Nelson. Tiger's records are ridiculous, as you folks have already mentioned. Another one I like is six straight years of winning a USGA National Championship. Three U.S. Juniors from 1991-93, then three straight U.S. Amateurs from 1994-96. 2. The wide-open neo-links layout at Trinity Forest, the new home of the Byron Nelson, made its debut last week, but not everyone was quick to praise it. "I think it's best said under the lesson if you don't have anything nice to say, don't say anything at all," Kuchar said. Geoff Ogilvy had a different view: "We get coddled in the way we get treated, but variety is one of the best attributes golf has." How would you assess Trinity's debut, and should the Tour be visiting more courses of the same ilk? Ritter: It's a shame the weather caused a late finish, but from my spot squarely on the couch, it was fun to see a fresh and unique layout. It's a shame it didn't draw a better field, but one week after the Players, what are you gonna do? The course added some buzz. I'd be fine seeing a couple more links-style tracks on the schedule. Dethier: Bring ‘em on! Courses that look fresh and demand different types of shots should be heartily welcomed. There can be a bit of groupthink on Tour and an aversion to anything different or uncomfortable, and that's part of the reason we don't see more risks taken by the Tour, but Trinity Forest looked very cool. I would have loved more wind and firmer, faster surfaces to really show the course at its best, but I thought it was a fun test and received generally positive reviews. Would be interested to hear a locker room post-mortem. Sens: Love to see the Tour mixing it up now and then. And wouldn't mind seeing it more. The endless variety of designs is part of what makes playing golf so great. It's a huge part of the appeal of watching it, too. Passov: Solid debut from Trinity Forest, even if the PGA Tour took some of the fire out before play even began. Fairways and green surrounds were cut slightly higher than they are for member play, greens were a touch slower, and the grass was greener that it should have been. Yet, I understand why they did it. First year, mediocre field, fear (unwarranted) of horror stories…the Tour wanted the players to be stress-free and hopefully spread the word for next year. Having said that, it was really hot, and there wasn't a lot of wind — but so refreshing regardless to see the ball bouncing around, and where angle into the green actually mattered. I'm a tad disappointed with Kooch's reactions, considering how well he solved the puzzle of the Olympics course in Rio, on his way to bronze, a course where ground conditions, thoughtful placement and proper angles also were of critical importance. Remember, Matt, Bobby Jones walked off St. Andrews in frustration his first time there. Later, it became his favorite course. 3. Hello, Aaron Wise. The 21-year-old finished T2 at the Wells Fargo Championship two weeks ago and then won the AT&T Byron Nelson on Sunday. Is there a player Wise's age or younger who you're more bullish about? Ritter: Not many. Wise had a stellar NCAA career and as we've learned many times over, young guys show up on Tour today ready to win. One name to add to the list: the 19-year-old Chilean Joaquín Niemann, who was the top amateur for about a year and just turned pro. He might win a Tour event before he can legally buy beer. Dethier: Wise has had massive success at every level. He excelled in college through 2016, Canada the summer after that, finished in the top 20 on the Web.com Tour last year and now is showing that same form against the world's best players. Picking anyone else would just mean projecting what they might do; Wise is officially announcing his arrival. Sens: Lydia Ko. Barely 21. Two majors already, and surely more to come. Passov: Remember that Jon Rahm is only 23. 4. Jordan Spieth tied for 21st at the Nelson, but a missed one-footer in the second round was another reminder that he's struggled with the short ones this season; he's ranks 202nd on Tour from three feet and 191st from four feet (and is 183rd in strokes-gained: putting). Any cause for alarm? Ritter: Mild alarm. Anytime you're outside the top 200 in a stat category, it's a problem, and in this case more mental than physical. Spieth is still one of the most mentally tough guys out there, so I think he'll be OK. But this is certainly a rough patch. Dethier: I think those numbers really come down to missing like, two or three extra putts over the course of the season, so I'm not sure they're cause for alarm, exactly. But putting is art as much as science, and it's elusive; it seems like Spieth is going to have to win with his relentless ball-striking until his putter returns. Even when he inevitably gets more comfortable on the greens, I don't think we'll ever see Spieth putt the way he did during his peak two years ago. Scar tissue. Sens: "It's elusive." Dylan makes a key point. Golf is notoriously fickle, and no part of the is more fickle than putting because the margins between good putting and just average putting are so razor-thin. The longest hitters in the game can count on being the longest hitters every week. That advantage is pretty much permanent. Not so the best putters. That's a fairly obvious point but it applies directly to a player like Spieth, who doesn't dominate by shrinking golf courses with his power. His greater gift has been to make the hole look huge, and that is something that can come and go more readily. Passov: I don't know about fickle and elusive, but I just can't see how missing so many short putts so often can be good for one's confidence. He wasn't in the lead or in the hunt, but at what point does Mr. Spieth start pressing when he is in contention, and starts focusing more on lags than on makes? It happened to Tom Watson for awhile, and it cost him dearly for several years while he was still in his late prime. 5. Last week the Supreme Court struck down the Professional and Amateur Sports Protection Act, which clears the way for states to legalize sports gambling. While Tour commissioner Jay Monahan has supported the legalization of sports betting, it's still unclear how it will impact the golf world. Could you see yourself wagering a few dollars here and there — you know, just to keep things interesting? Dethier: Um, yeah. Did you see how much fake money I won on Tony Romo prop bets in March? Sens: Sure. As that panhandler once told David Letterman, "I've got gambling money!" Passov: Absolutely. When you're in Vegas or in the U.K., you do it out of habit, and opportunity. I never spend much, but to keep things interesting, you plunk down a couple of bucks — just like we all do at home in our Nassaus. This could get fun. 6. Prince Harry and his new bride aren't big golfers, but in honor of their big day, we must ask: What is your favorite Royal course in the British Empire? Ritter: I'll take the original: the Royal and Ancient Golf Club at St. Andrews. It's still the best British Open venue, and playing it is like experiencing golf in a museum. I've played it twice and can tell you what I made on every hole and most of the clubs I hit along the way in both rounds. (Just ask me!) There's nothing like it. Dethier: I've never been! They all look unbelievably cool on TV, though. If we're going British Empire from a couple of centuries back, I'd nominate Nova Scotia's Cabot Links as the best Canadian course I played. It's spectacular — and I've heard Cabot Cliffs is even better! Sens: Can we include countries formerly in the British Empire? In that case, Royal Melbourne. If not, Royal County Down, followed closely by Royal Portrush. And if you're looking for a sleeper, I'll take Royal Montrose for a thousand, Alex. Passov: I've never had the pleasure of playing Royal Worlington and Newmarket in England, a course that famed writer Bernard Darwin called, "the Sacred Nine," but my favorites are Royal St. George's, the wild and woolly Open venue on England's Kentish coast, and Royal North Devon, the oldest links course in England, an Old Tom Morris design dating to 1864. Parts of the course are on "common" land, which means horses, cattle and sheep have as much rights to the fairway as you do. It's also known as Westward Ho! Which is very cool, too.